This tech combines the company's hybrid LED-laser light source with an otherwise standard ultra-short-throw design for brilliant, shadow-free images up to 110" diagonal. The built-in short throw lens and advanced mirror system enables projectionan 80" image from just 1.5 feet away. Eco-friendly benefits not only serve the environment well, but translate into a low running cost. This value projector offers out-of-the-box interactivity and an ultra-short throw lens. 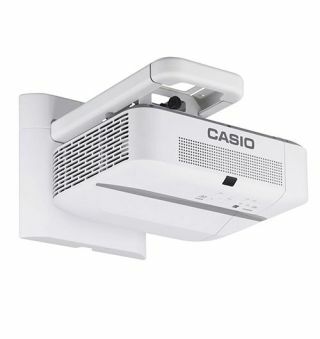 The embedded camera, along with an included laser curtain module and wall mount kit, offers a low-cost, big picture alternative to interactive whiteboards and displays. Ideal for BYOD classrooms, this display delivers 3,200 lumens of color and white brightness for dynamic presentations. It also features wireless functionality and advanced connectivity, so teachers can share content from multiple student devices, including Chromebooks — up to four at once with Moderator software3. Quiet, compact and powerful, WXGA images are presented with 3,100 lumens color light output and high 20,000:1 contrast ratio with 3LCD tech. This is a good option for midsize classroom, with a new 'Vivid' picture mode ensuring even richer, more vibrant colors.